While studying abroad in Rome, Ethan Mack has a chance encounter with the pontiff during his weekly Wednesday Mass. 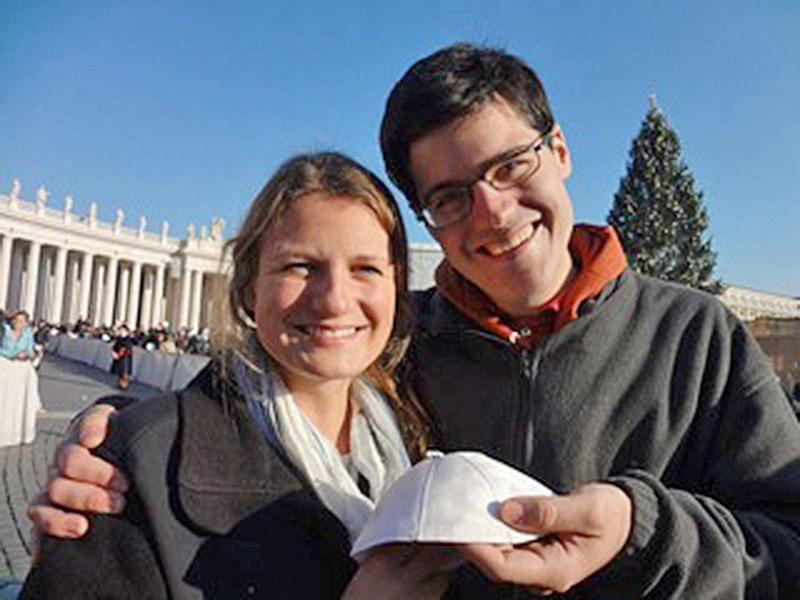 A Portland native will return from a semester in Rome with an unexpected souvenir: a skullcap worn by Pope Francis. During his weekly Mass on Wednesday, Pope Francis stopped his vehicle as it passed through the large crowd in St. Peter’s Square and asked a guard to take a white skullcap, called a zucchetto, from Ethan Mack of Portland and his friend Katherine Rich of Minnetonka, Minn.
Pope Francis switches skullcaps in Rome on Wednesday after receiving a new one as a gift from Boston College exchange students Ethan Mack of Portland and Katherine Rich of Minnetonka, Minn. Pope Francis gave his skullcap to the students. The pope looked at it, apparently checking to make sure it was the right size, then removed his own zucchetto and handed it to the students. 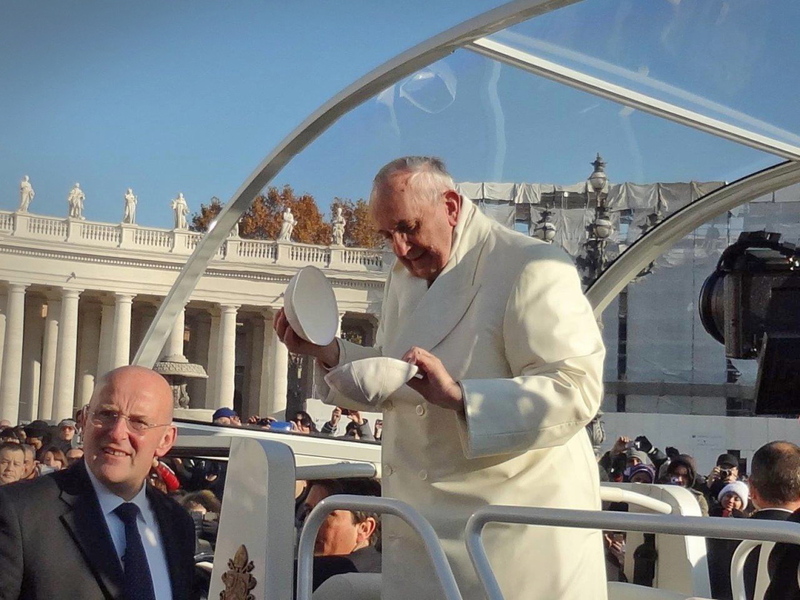 “For the Pope, this was a simple act of kindness coming from a man who exemplifies charity. But for us, it truly made our lives,” Mack wrote in an email Friday. Mack took a photo of the pope with the two white caps, mid-trade, and posted it on his Facebook page. Boston College, which both students attend, provided the photo and an email message from Mack to the media. “The pope then gave a nod and smiled right at us,” Mack wrote. Although the students expected their families and friends to get excited, they didn’t expect that their story would make headlines. “It has been a bit of a shock,” Mack said. Pope Francis, who assumed the papacy in March and was named Time magazine’s Person of the Year this week, has excited followers with his humility, compassion and common touch. As a Jesuit, he has especially inspired members of that Catholic order. But he isn’t the first pope to swap caps with the faithful. The practice of giving skullcaps as a keepsake goes back decades. Some pontiffs have given away their caps when presented with new ones, while others have taken new caps and put them on their heads before giving them back. Popes John Paul II, Benedict XVI and Francis all have continued the custom, according to a book on the history of the skullcap written by the Rev. Antonio Hernandez. Mack, 21, is a 2011 Deering High School graduate studying philosophy and political science at Boston College, a Jesuit school. He is finishing a semester at John Cabot University, an American school in Rome. Pope Francis asked his driver to stop at the last second and a guard passed him the cap. Mack said Pope Francis checked the size, donned the new cap and had the guard pass his old one to the students. He said they plan to give it away. “Neither of us feel it is right to hold onto it,” Mack said. For the students, more important than having the cap – or even the experience – is showing people the real Pope Francis through their story. Staff Writer Leslie Bridgers contributed to this report.